This quaint old railroad station built in 1911 is located at 138 Hope Street North, Port Hope, and is now home to a Ministry of Transportation office. A brick Chateauesque architectural style building designed by Ralph Benjamin Pratt, it has been through many changes and additions but is still a very handsome structure. 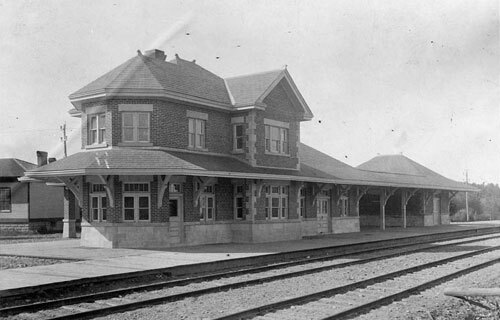 Three such Canadian Northern (CNoR) train stations were constructed locally, Belleville and Cobourg have not survived. Much of the track bed is still visible in the Port Hope area especially when crossing Sylvan Glen Road (east side) just south of Sylvan Glen Conservation Area. Another especially great view of the former rail bed can be appreciated from the 4th Line west of County Road 10 south of Canton were the track is greatly elevated. The viaduct’s bridge abutments still remain in Port Hope crossing the Ganaraska River west of the station. In 1895 William Mackenzie and Donald Mann had a dream of building another transcontinental rail link in Canada. By 1906 the Canadian Northern started construction of a line south from Perry Sound to Toronto and north to Capreol. In 1910, they began their line from Toronto to Ottawa and Montreal. As the Grand Trunk had the prime locations close to the shores of Lake Ontario, the Canadian Northern was forced to build well north of the lake. With no access to the ports on the north shore of the lake until Port Hope, construction started in 1911 comprising 105 miles of line between Toronto on the west and Trenton on the east. By 1915, CNoR was operating Canada’s second transcontinental rail line with over ten thousand miles of track. In October 1911, the Canadian Northern Railway started its passenger service. About 1500 people boarded the train for the initial free trip from Trenton to Toronto with three full coaches. Six more coaches had to be added later, plus two more at Cobourg, two at Port Hope, and two at Orono and at arrival in Toronto it was hauling 15 coaches. Orono Station was located at the south east corner of Church and Princess Street and became a major and very busy station on this line. Other local stations were located in Starkeville, Brooklin, Osaca, Tyrone, Canton, Cobourg and Belleville. Traces of the right-of-way can still be found today crossing over Mastwoods, Anderson and Kellogg Roads. From Canton (station), Hawkins and Dale Roads the rails headed south into Port Hope. After crossing over the CNoR viaduct it heads east crossing Ontario, Wellington, Rose Glen, Peacock, Hamilton Road and Gage’s Creek on its way east. In Cobourg it crosses Sinclair, Burnham, William, Ontario and Division Streets (station.) Pictured below is the Canadian Northern Railway passing under the Ontario Street overpass in Port Hope, east of the train station. By 1918 the Canadian Northern Railway was bankrupt. The Canadian Government Railway trusted with the board of directors of CNoR, takes over and appoints a new Board of Directors. In 1919 the government owned Canadian National Railway was officially created. Canadian National then took over many of the redundant and failing rail lines like the CNoR and even more profitable ones like the Grand Trunk, which had earlier acquired Port Hope’s Midland Railway. 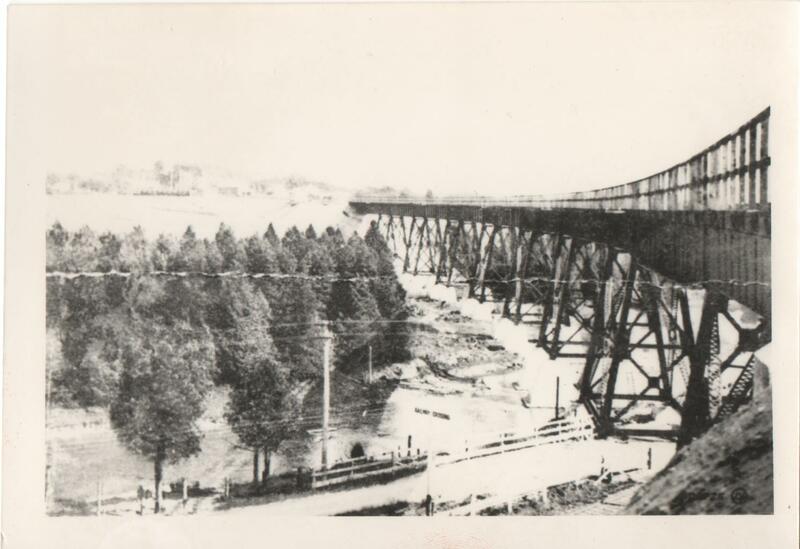 1925, the old Canadian Northern Railway viaduct is now being torn down to use elsewhere. 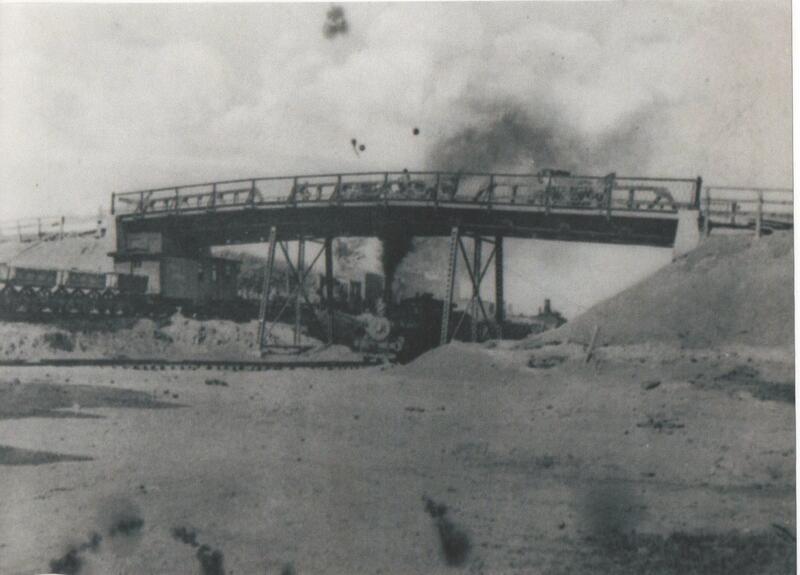 Crews removed the long span which crossed over the Midland Railway tracks, the Ganaraska River and Cavan Street. The five spans and towers were to be used in Pembroke and the rest to be used near Cochrane Ontario. The lifting work was done by two long armed cranes, one worked from the viaduct and the other from the Midland Railway tracks below. The bottom crane had an arm long enough to be above the girder, over fifty feet from its own track level. With a crane hooked to either end the girders were raised three to four feet then swung slowly at right angles to be parallel with the tracks below and gradually lowered to the ground. A better grip was gained and each was hoisted high enough for three flat cars to be run underneath them and carefully lowered onto them where they were well secure to the cars so as not to move in transit. The north girder was lowered in the morning and the other was lifted a few hours later. Pictured below is the Canadian Northern Railway Bridge over the Ganaraska River, the Midland Railway and Cavan Street, Port Hope. The work had to be completed by three p.m. and it had to be done on a Sunday as traffic could not be held up on a week day on the Midland (CNR) below the viaduct on Cavan Street. The remains of the viaduct were taken up by cranes working from the viaduct, moving everything as they retire and the steel and rails was taken to Cobourg where the track joins the Canadian National Railroad mainline. Rail removal at this time effectively ended rail traffic from Cobourg to Orono on the former KNoR. Note to walkers, when hiking through the Orono Crown Land look for the rustic old bridge on a short trail located on the former CNoR as well as the rail trail found in Stephen’s Gultch Conservation Area. In 1925 a new spur line connecting the old CNoR with the Midland track (now owned by CNR) into Port Hope is now complete. A new train service was started on the old CNoR and work was completed on a new junction near Choate’s woods in what is now the Port Hope Conservation Area. This meant that now trains from the Orono line will share a common rail line with the Midland RR and come directly into Port Hope where they both will connect to the Canadian National Railway system. Unfortunately, this move eliminates any further need of the former CNoR station. This new junction without a name for some time eventually was named Ronnac … which is Can Nor spelled backwards. Speaking of unusual names…is there any truth that Orono is really only Toronto without the T’s? Hey guys. Great article on the CNOR through Port Hope. I have explored virtually all of the scars that the line left through the area except one. There was I believe a fairly substantial bridge where the line crossed Gages Creek. You can see some of the remaining structure on Google Earth. Unfortunately the area is fairly inaccessible and would require a hike up the creek. Any info on this? Brian,Thanks for the comment on the CNoR. The 2oldguys would sure like to get a picture of the former bridge site. We are looking into the best way to get there. I think we can get there without trespassing on private property (rail bed) or walking up the river from Hwy 2. Will be pleased to keep you informed. That would be great guys. I think the power line from Hamilton Rd follows the track of the old railbed. It crosses Gages creek and then angles down and crosses County Rd 2 just before the shooting range. You can still see some of the raised bed where it crosses Augustine Rd. Pics of the structure at Gages Creek would be awesome. Brian, regrets, was hoping for an easy way to get to the bridge site. 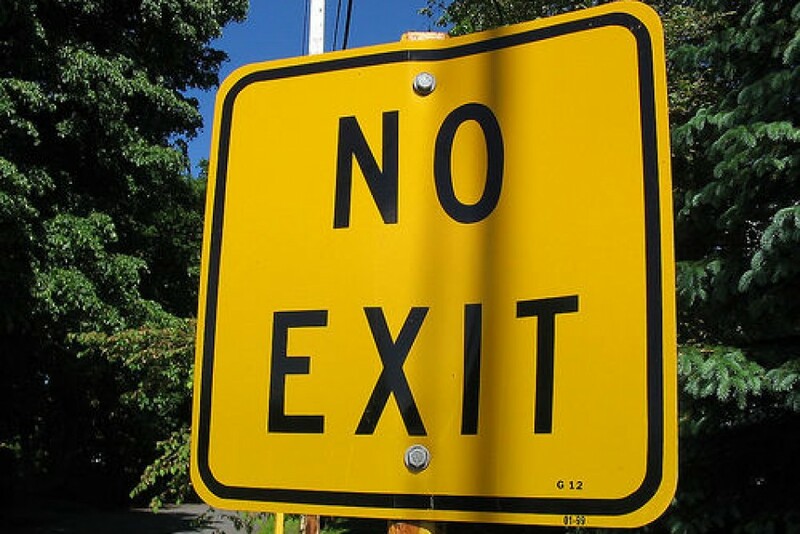 No Exit Irwin Moore Road, just east of Gage’s Creek bridge seamed like a possibility, but it stops too far south and west. The bridge site is on private property (Hunco Farms) and has no road allowances anywhere near. The power does line follows the rail bed over the bridge site, but would be quite a hike and would likely require permission from Hydro to get to it. Any readers with more information or pictures of this former bridge? Thanks anyway Ranger. I’ve asked around and so far only found one “old guy” who hiked there as a kid. Didn’t get much of a description from him other than “neat stuff”. I guess the tantalizing satellite view on Google Earth is as good as it gets…so close and yet so far away. Thanks again and keep em coming. Brian, Don’t give up yet, we have a lot of knowledgeable local readers and from across Canada and the U.S. I am still searching archives. Love a good challenge! Just think…. Something a couple of hundred yards from two main roads and an urban subdivision and we can’t get to it! Very few places on earth are inaccessible, this is one of them! We plan on walking up Gages Creek to the bridge. We got the rest of the Winter to figure out who owns the land. One last thought. When trout season opens in April I’ve seen cars parked on Hamilton Road. I wonder if fishermen make it that far up the creek? Brian, it would seem likely that they might get that far north on the creek. Wonder if any of them have taken pictures of the bridge abutments?